How Mangu is Really made. What you will need is to be Dominican in order to make the Mangu right. You will need about 4 plantains(green). A pot with boiling water all ready. Add the plantains in when boiling and leave it there till is tender and yellow-brownish. After you see this color take it out and drain the water and add as much butter as you like, milk, salt and please no pepper. Mash it all together until its creamy then taste it to see if it's appropiate for your taste. Cut some red or white onions as much as you like and add some oil in a frying pan till it's hot and then add some onions. Wait till its caramelized and brownish. Add the onions to the Mangu but dont mix it in and if you like add some American cheese. (You can also) add some salami and Dominican white cheese, but fry the white cheese as if it were tofu and then add it in to the Mangu. Comments for How Mangu is Really made. I am very happy to see this amazing dish! I think it is very easy to make this dish following your instructions. So I am going to prepare Mangu at my home. I will definitely share my review. Keep updating! This mangu looks really great. Thank you for the detailed recipe and I would be back for more recipes. You are doing a great job. Mangu, what a nice name given to a dish. My mother made this at home. 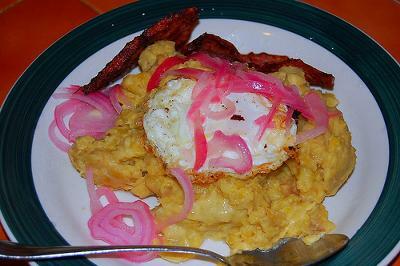 As a Dominican I am not satisfied by myself that I didn’t know how to prepare this mangu. I was born and studied in USA. But my mother is a great cook. The Mangu was awesome.